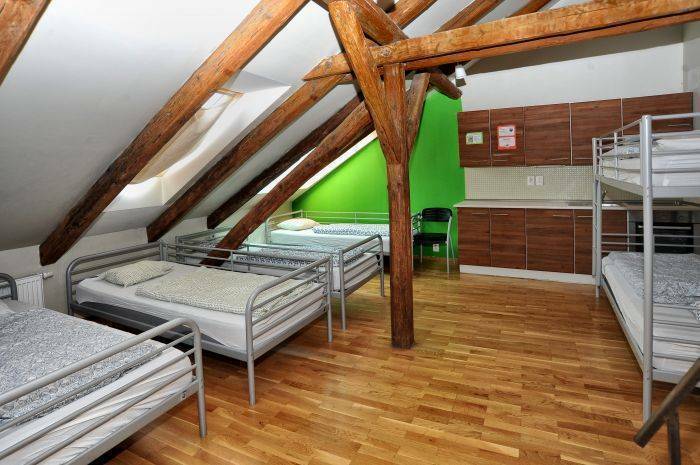 This place is different compared to most hostels, since it is more of a home than simply a bed. It is a place where we add a personal touch. A place where you can be whoever you want to be. Whether you like to chill out in our backyard garden, have a chat with one of your fellow travellers while you cook up dinner, completely change your travel plans in front of the computer, have a laugh and a cold beer in our bar, or chill on our comfy couch watching a movie, we look forward to meeting you! 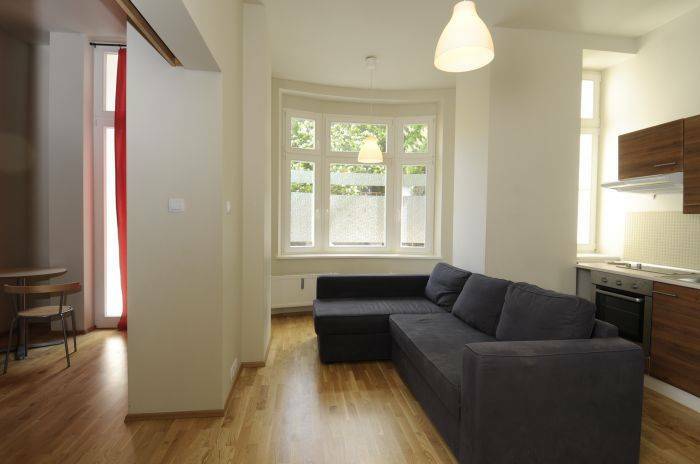 Our place is located in the new, upcoming art nouveau area of Prague. You will find several restaurants, bars, and clubs just around the corner. They are all very local and great value. Supermarkets and several mini-markets are just minutes away. It is only a 15-minute walk, or a five-minute tram ride, to get yourself to Old Town Square. This is definitely a place you will not want to leave soon. Do not worry about carrying that heavy backpack any further than our doorsteps - we have an elevator! 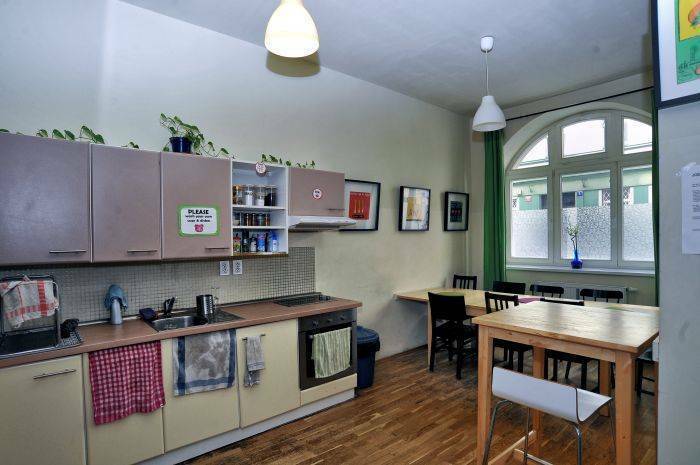 Our fully equipped kitchen is waiting for you to make your own home-cooked meal. The lounge provides you with a wide range of DVD`s, a big comfy sofa and computers with free internet. If you feel like escaping the busy city life you can relax in one of the balconies, patios or in our beautiful garden. Our place will be filled up with backpackers, but heads up, every room has its own bathroom. As we do not like rules too much ourselves, there is no curfew, or any weird prohibitions. Our staff will go well out of our way to assist you anyway possible. Either to tell you about some undiscovered spots in Prague or to take you out for world-renowned Czech beer; nothing is too crazy for us. Since we have been all over the world ourselves, we think we can provide you with a perfect mixture of hospitality and experience. Perhaps we can even talk with you in your own language. Cleanliness is a thing we care about a lot. That is why our lovely cleaning staff works everyday to keep the place shiny clean. 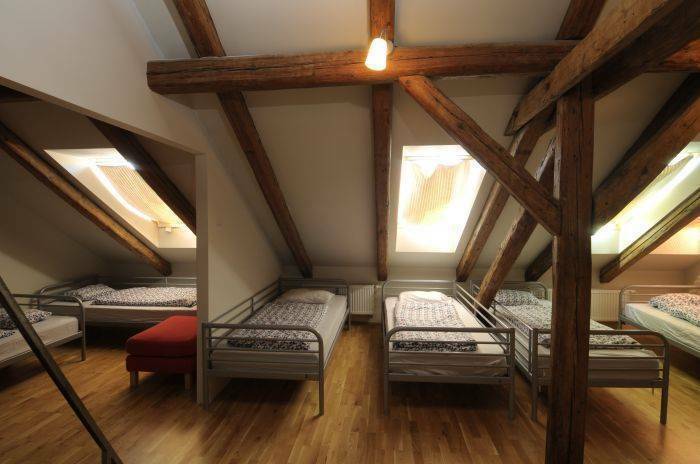 Thank you for making a reservation with our hostel - Hostel One Prague! This property has a 2 days cancellation policy. (e. g. if your check in is on Friday, the last day for free cancellation is Tuesday). Our reception is open 24h, but it would be great if you could inform us about your arrival time. 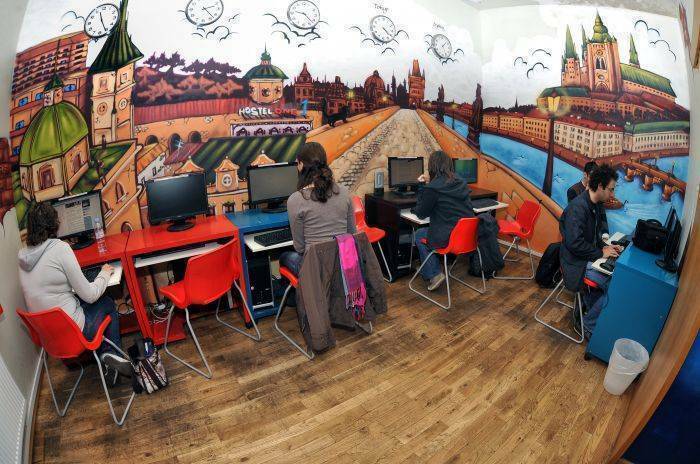 After your stay, you will receive an email which gives you the chance to rate our hostel. Please leave a comment or recommendations for your fellow travelers. Please consider our actual rank before submitting your rating, we appreciate your feedback! PLEASE NOTE: The official check-in time is 15:00. If you arrive before check-in time, you can leave your belongings in our luggage room or ask our staff about the safety deposit. Cheers for reading this & have a nice trip to Prague - we look forward to welcoming you in person! Every room from double private ensuite till the biggest 10 bed mixed dorm has a private bathroom with shower and WC. (e.g. if your check in is on Friday, the last day for free cancellation is Tuesday). 1) As you leave the terminal in Prague Airport you catch bus AE (Airport Express). Drop off on the last stop (Hlavni nadrazi). See directions from the main train station below. 2) As you leave the terminal in Prague Airport you catch bus number 119 with direction Dejvicka. This is also the name of the last spot on which you will depart. Here you hop on the green metro line A, and get off on the fifth stop named Muzeum. In this stop you will change to the red metro line C. You will get off on the first stop of the red line, Hlavni nadrazi. If you leave the station and enter the park turn right. At the end of the road in the park you will find a tram stop Hlavni nadrazi, on street Bolzanova. You take line 5, 9, or 26 in the right direction (so towards the railway bridge) and get off on the second stop Lipanska. As you depart the tram you cross the street, and keep on walking in the opposite direction as the tram. The second street on the right, Cimburkova, is our street. We are situated on number 8, on your right hand. 3) If you do not feel like using the cheap public transport, you can also make use of a shuttle service that we can arrange for you (please send an email or call). Hop on to the red line with direction Haje, and get off on the first stop named Hlavni nadrazi. If you leave the station and enter the park turn right. At the end of the road in the park you will find a tram stop Hlavni nadrazi, on street Bolzanova. You take line 5, 9, or 26 in the right direction (so towards the railway bridge) and get off on the second stop Lipanska. As you depart the tram you cross the street, and keep on walking in the opposite direction as the tram. The second street on the right, Cimburkova, is our street. We are situated on number 8, on your right hand. If you leave the station and enter the park turn right. At the end of the road in the park you will find a tram stop Hlavni nadrazi, on street Bolzanova. You take line 5, 9, or 26 in the right direction (so towards the railway bridge) and get off on the second stop Lipanska. As you depart the tram you cross the street, and keep on walking in the opposite direction as the tram. The second street on the right, Cimburkova, is our street. We are situated on number 8, on your right hand. In this train station you hop on the red metro line for three stops and depart on Hlavni Nadrazi you leave the station and enter the park turn right. At the end of the road in the park you will find a tram stop Hlavni nadrazi, on street Bolzanova. You take line 5, 9, or 26 in the right direction (so towards the railway bridge) and get off on the second stop Lipanska. As you depart the tram you cross the street, and keep on walking in the opposite direction as the tram. The second street on the right, Cimburkova, is our street. We are situated on number 8, on your right hand.